Have you been imagining how you can sleep 8 while camping at your favorite campsite? 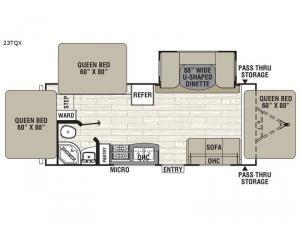 This Freedom Express Ultra Lite 23TQX provides 3 queen tent end beds, one for yourself and two for the others, plus a single slide out u-shaped dinette. You can even relax on the sofa that might sleep a smaller person. You have plenty of kitchen amenities, a full bath, and storage for a long vacation or short get-a-way. The exterior pass-through storage is perfect for the fishing and outdoor gear. Take time for yourself and explore the freedom you will enjoy in this expandable. With any Freedom Express Ultra Lite expandable you will appreciate the ease of towing behind your family vehicle and the Secure-Lok tent system allowing you to skip the Velcro and bungees for quick set-up and tear-down. Come see why everyone wants an expandable.